Home » bbc , doctor who , science fiction , television » "He's the one who broke the promise": Chris lost his mind watching "The Name Of The Doctor" and still hasn't fully recovered from the DOCTOR WHO season finale! "He's the one who broke the promise": Chris lost his mind watching "The Name Of The Doctor" and still hasn't fully recovered from the DOCTOR WHO season finale! In hindsight it was for the best that I waited nearly two days to watch "The Name of the Doctor". I didn't dare let this episode begin without my girlfriend/fellow geek Kristen. And in the aftermath of those final three minutes she literally had to calm me down and keep me from staggering as I walked up the stairs. If I had attempted to watch it while she was still out of town, Lord only knows what kind of injury would have ensued. Heck, I went into a fit of spastic fanboygasm simply when Simeon mentioned The Valeyard. "The Name of the Doctor" was season finale caliber, definitely. But with 2013 being the fiftieth anniversary celebration of Doctor Who it's safe to say there was already an expectation for showrunner Steven Moffat to up the ante for the occasion. The thing is: the stuff many if not most (or even all) the fans were expecting to be in the fiftieth anniversary special, Moffat pulled the trigger on in "The Name of the Doctor"! So has Moffat shot his wad already? Or has he something even more diabolical planned for November 23rd? Advance warning is in order: make sure there's plenty of space behind that sofa to duck and cover with! This was an episode of extremes. No previous story has ever given us The Doctor from alpha to omega and everyone(?) in between. Right off the bat "The Name of the Doctor" showed us something we had never seen before: the First Doctor committing grand theft TARDIS and making his run from Gallifrey. Ten incarnations later the Eleventh Doctor (Matt Smith) chooses to defy all caution and come at last to Trenzalore: the one place in the universe he is to never, ever go. And now we know why: Trenzalore is where The Doctor's grave is. And when you are a traveler through time and space, your own grave is never a place you want to visit. I thought the big reveal about Clara (Jamie-Louise Coleman) was done well, particularly in light of how this half-season of Doctor Who has been very uneven since the show returned in late March. With the hindsight of seeing how Clara fits into the bigger picture of The Doctor's story, that's left me more appreciative of how Moffat has handled her from her first appearance in "The Asylum of the Daleks" and then "The Snowmen" onward. Going back to the fiftieth anniversary looming over everything: I figured we'd see all the Doctors but I also feared there would be no way to really "involve" them all without resorting to deus ex machina at its hokiest. Clara proved to be an amazingly elegant solution and by the end of the episode, she left no doubt about earning her place as a companion of The Doctor. All right, something I'm a bit fuzzy about: is this meant to be the last time... I mean, the really last time... that we'll be seeing River Song? There was some grave finality (horrible pun intended) in her interactions with The Doctor. If this is the last time well, one can't help but admire the irony. River Song's first appearance was in a two-part story five years ago that ended with her dying to save her future husband. "The Name of the Doctor" has River after the events in The Library, with everything about her and The Doctor laid bare at last. Alex Kingston as River Song has been one of the purest delights in all of television these past few years and if this is "goodbye sweetie" indeed, that is a void which will not be easily filled. I loved how Madame Vastra, Jenny and Strax were brought back once again. It wouldn't be a proper season finale without that wacky trio (again I insist: give them their own spinoff series!). Strax's scenes were especially hilarious, particularly when he asks that drunken Scottish lout to knock him unconscious with the shovel. The Whisper Men: ummmm... still trying to figure those guys out. Are they intended to be the distant cousins of the Silence? Simeon didn't really "do" it for me as a main villain... until he spoke of The Doctor's future and referenced The Valeyard (so we know that gun is still on the wall waiting to be fired). I think what most impressed me about him is that whatever it is about The Doctor still to come, Simeon was perfectly able and willing to let himself be destroyed in order to undo The Doctor's entire existence. "The Name of the Doctor" sets an all-time record: eleven Doctors in one episode! There hasn't been a story with so large a cast of Doctors since 1983's "The Five Doctors". And by the way: they are all in there somewhere. It took me awhile to find Eight and Ten, but they appear also (Clara sees the Eighth Doctor very briefly on the same beach as the Second Doctor, and that's the Tenth Doctor's back that Clara is looking at in The Library). In every way that I could have conceived, "The Name of the Doctor" was the epic that I had been stoked to see and much, much more. I've watched Doctor Who for more than thirty years. And THIS was the scariest, the most unexpected and DARKEST turn of events in the whole history of the franchise. The mythology got rocked and rocked HARD in those final 2 or 3 minutes. It's absolutely the riskiest thing ever done in the entire history of the show and for good or ill Steven Moffat has crossed a terrible, terrible line with this. There was stuff in this episode that I was certain we would only see in the fiftieth anniversary special... and already Moffat's not only fired all that off, he chased it down with a tactical nuke. 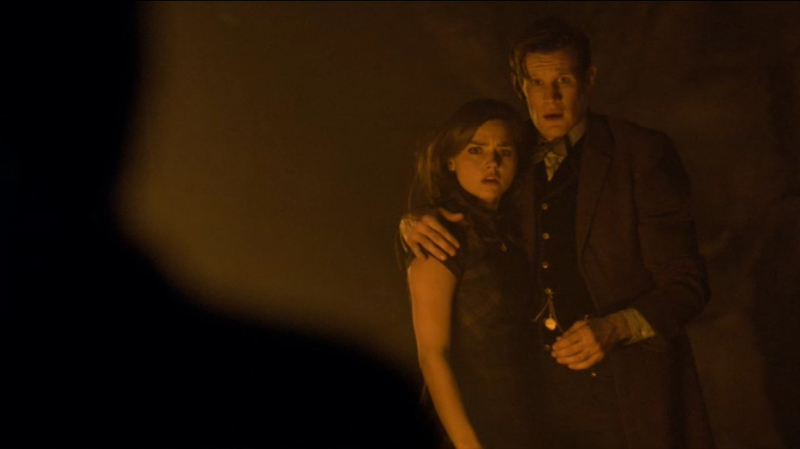 "The Name of the Doctor" is the most insane, most senses-shattering cliffhanger in television history. Granted it needed almost fifty years of material to pull it off but still... And my poor brain is still reeling from it. Remember Lost and it's third-season finale "Through the Looking Glass"? Yeah the one that sucker-punched us at the end with the reveal that those flashbacks of Jack's were really flash-forwards to a time after Jack escaped the Island? Well "The Name of the Doctor" was a thousand times more gray-matter-melting than that. "The Name of the Doctor" didn't just peg the needle and break it off, it sent it flying madly out the car window. Desperate times call for desperate measures so I'm giving it TWELVE Sonic Screwdrivers out of a possible five. One for each of them. If you've seen the episode you know what I'm talking about. "But not in the name of the Doctor." That's got my vote for most sinister dialogue in Who history. For the past day or so there have been two ideas about John Hurt's Doctor that I've been mulling more than others. One is this: what if John Hurt is playing the Doctor *before* he was ever the First Doctor. I mean, we've seen at last the First Doctor and Susan fleeing Gallifrey... but we still don't know WHY they fled. What if Hurt's Doctor did something so atrocious, so heinous, that it forever stained the name "Doctor" and the man we know as the First Doctor had no choice but to run. The other possibility is that it will have been Hurt's Doctor - NOT the Eighth Doctor or the Ninth Doctor - who was the one who most took part in the Last Great Time War. But there are problems there too. From the start of Eccleston's all-too-brief time as The Doctor, the Time War is a subject which The Doctor has never evaded. We *know* that he fought in it and that he *ended* it: the Time Lords and the Daleks alike BURNED... and The Doctor MADE it happen. He has carried the guilt of his actions all this time and he's never made a secret of that. Whoever John Hurt's Doctor is, he represents something that MUST be far, *far* worse than anything we know of The Doctor's involvement with the Time War. Okay, there is one other possibility that's crossed my mind: that Hurt's Doctor *is* an incarnation from the Time War. Remember back to the Tenth Doctor pleading with The Master not to break the time lock, because the Time War and all its horrors would be free. Not just the Daleks, the Doctor said. But also the Skaro Degradations, the Horde of Travesties, the Nightmare Child... and last of all he spoke of the Could-Have-Been King "with his army of Meanwhiles and Neverweres". Of all those hellish evils from the Time War, the *only* one that has been even remotely hinted at since has been the Could-Have-Been King. So... what if the Could-Have-Been King was none other than The Doctor himself? Hope to have a review of Star Trek Into Darkness up later this evening or sometime tomorrow. My memory of details from the classic run are fuzzy. But I know in the "Doctor's Wife" ep it was stated that the Doctor stole with the TARDIS and she stole him. We see from this ep that Clara knew which TARDIS he should steal (so the TARDIS communicated with her?). As to Hurt's caracter, I'm waging on a pocket universe Doctor who was split off of the Doctor to do the dirty work he could not/would not do. But we will see. p.s. loved how River said the Doctor's name to open the door so we still don't know it!